Organic chemistry is the study of the structure, properties, composition, reactions, and preparation of carbon-containing compounds. Covalent bonding is a chemical bond that involves the sharing of electron pairs between atoms. Lewis model are diagrams that show the bonding between atoms of a molecule and the lone pairs of electrons that may exist in the molecule. A molecular orbital (MO) can be used to represent the regions in a molecule where an electron occupying that orbital is likely to be found. Resonance structures: when more than one Lewis structure may be written for a molecule, a single structure is not sufficient to describe it. Conjugated systems: system where electrons are delocalized in a molecule. 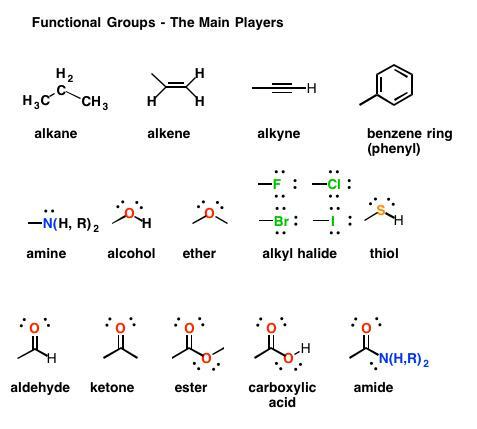 Functional groups: the portion of the structure that controls the reactivity of the entire molecule and much of its physical properties. Organic chemistry is the study of the structure, properties, composition, reactions, and preparation of carbon-containing compounds, which include not only hydrocarbons but also compounds with any number of other elements, including hydrogen, nitrogen, oxygen, halogens, phosphorus, silicon, and sulphur. The range of application of organic compounds is enormous and also includes, but is not limited to, pharmaceuticals, petrochemicals, food, explosives, paints, and cosmetics. A covalent bond, also called a molecular bond, is a chemical bond that involves the sharing of electron pairs between atoms. These electron pairs are known as shared pairs or bonding pairs. The stable balance of attractive and repulsive forces between atoms, when they share electrons, is known as covalent bonding. There are three types of covalent bonds: single, double, and triple bonds. A single bond is composed of 2 bonded electrons. Naturally, a double bond has 4 electrons, and a triple bond has 6 bonded electrons. Polar covalent bonding is the process of unequal sharing of electrons. It happens due to the differing electronegativity values of the two atoms. Because of this, the more electronegative atom will attract and have a stronger pulling force on the electrons. Thus, the electrons will spend more time around this atom. Lewis structures are diagrams that show the bonding between atoms of a molecule and the lone pairs of electrons that may exist in the molecule. A Lewis structure can be drawn for any covalently bonded molecule. Lewis structures show each atom and its position in the structure of the molecule using its chemical symbol. Lines are drawn between atoms that are bonded to one another (pairs of dots can be used instead of lines). Excess electrons that form lone pairs are represented as pairs of dots and are placed next to the atoms. The Lewis model limits second-row elements (Li, Be, B, C, N, O, F, Ne) to a total of 8 electrons (shared plus unshared). This means that one atom of carbon can combine with up to four other atoms. Therefore, organic compounds usually are large and can have several atoms and molecules bonded together. In their outer shells, carbon atoms have four electrons that can bond with other atoms. 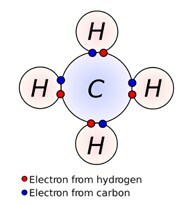 When carbon is bonded to hydrogen (which is common in organic molecules), the carbon atom shares an electron with hydrogen, and hydrogen likewise shares an electron with carbon. Carbon-hydrogen molecules are referred to as hydrocarbons. Sometimes more than one Lewis structure can be written for a molecule, especially those that contain multiple bonds. An example is ozone (O3). The structure of ozone requires that the central oxygen must be identically bonded to both terminal oxygens. In order to deal with circumstances such as the bonding in ozone, the notion of resonance between Lewis structures was developed. According to the resonance concept, when more than one Lewis structure may be written for a molecule, a single structure is not sufficient to describe it. Rather, the true structure has an electron distribution that is a “hybrid” of all the possible Lewis structures that can be written for the molecule. In the case of ozone, two equivalent Lewis structures may be written. We use a double-headed arrow to represent resonance between these two Lewis structures. This sometimes means that a pair of electrons is delocalized, or shared by several nuclei. A molecular orbital is a region of space within the molecule where there is a high probability of finding a particular pair of electrons. A molecular orbital (MO) can be used to represent the regions in a molecule where an electron occupying that orbital is likely to be found. Molecular orbitals are obtained from the combination of atomic orbitals, which predict the location of an electron in an atom. For methane, the molecular orbital is called sp3 and has a tetrahedral shape. The strongest type of covalent chemical bond is done by sigma bonds (σ bonds). pi bonds (π bonds) are covalent chemical bonds where two lobes of an orbital on one atom overlap two lobes of an orbital on another atom. Each of these atomic orbitals has zero electron density at a shared nodal plane, passing through the two bonded nuclei. The same plane is also a nodal plane for the molecular orbital of the pi bond. In chemistry, a conjugated system is a system delocalized electrons in a molecule, which in general increases the stability of the molecule. It is conventionally represented as having alternating single and multiple bonds. The largest conjugated systems are found in graphene, graphite, conductive polymers, and carbon nanotubes. When an alkane carbon chain is modified in any way is said to be functionalized. In other words, a functional group has been introduced and a new class of organic substances has been created. A functional group is a specific arrangement of certain atoms in an organic molecule that becomes the centre of reactivity. That is, it is the portion of the structure that controls the reactivity of the entire molecule and much of its physical properties. An entire classification system of functional groups is based on atom hybridization. An isomer of a molecule has the same number of atoms of each element but has a different arrangement of the atoms. It has the same molecular formula as the other molecule, but with a different chemical structure. Isomers do not necessarily share similar properties unless they also have the same functional groups. 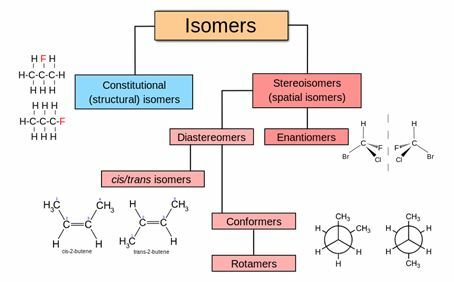 There are two main forms of isomerism: structural isomerism (or constitutional isomerism) and stereoisomerism (or spatial isomerism). In stereoisomers, the bond structure is the same, but the geometrical positioning of atoms and functional groups in space differs. This class includes enantiomers which are non-superposable mirror-images of each other, and diastereomers, which are not. Petrucci, Ralph H. General Chemistry: Principles and Modern Applications. Upper Saddle River, NJ: Pearson/Prentice Hall, 2007. Print.